A review of the uses of the term "food hub" reveals a dynamic and evolving concept. Since planners need to understand these various uses, we offer a preliminary framework for a food hub typology. We also suggest attributes and a definition that should be considered when assessing existing sites and planning for new food hubs. We then assess three food hub sites in Seattle, Washington, using our typology and characteristics that should be considered (audience, ownership, purpose, design and siting, and scale). Our assessment demonstrates that the strengths, viability, and vitality of each food hub are derived from attributes not currently considered by the most commonly used, type-focused definitions of food hubs. 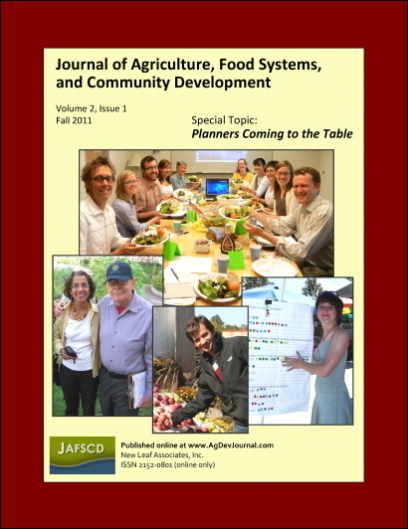 Our contribution adds clarity to the evolving discussion about food hubs, and describes elements for communities, particularly the planning community, to consider when planning for them. PhD student, University of Washington, Dept. of Urban Design & Planning; Seattle, WA USA. Evans School of Public Affairs & Urban Design and Planning; Seattle, WA USA. PhD student, University of Washington, College of Built Environments; Seattle, WA USA. MUP candidate, University of Washington, Dept. of Urban Design and Planning; Seattle, WA USA. MUP/MLA candidate, University of Washington, Urban Design and Planning & Landscape Architecture; Seattle, WA USA. Associate Professor, University of Washington, Department of Urban Design and Planning College of Built Environments; Seattle, WA USA.